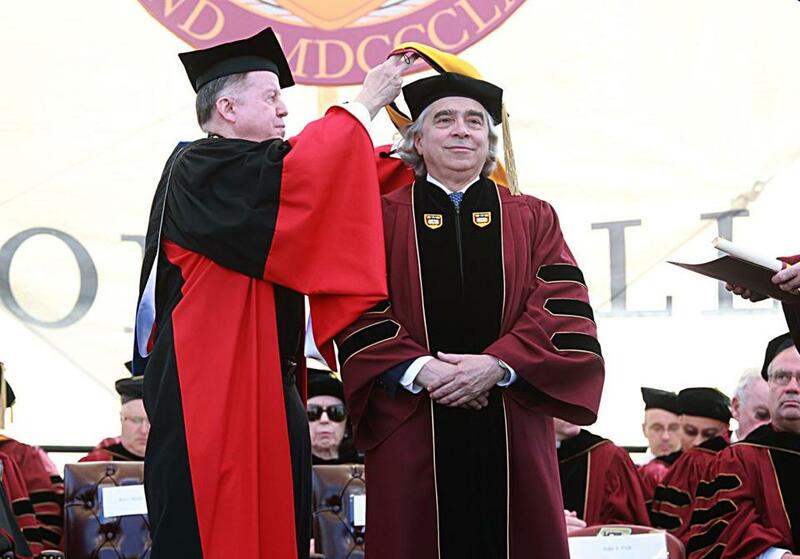 US Energy Secretary Ernest J. Moniz spoke at the Boston College commencement ceremony on Monday. US Energy Secretary Ernest J. Moniz, sizing up the golden anniversary of his Boston College commencement, urged the school’s class of 2016 on Monday to confidently embrace the future and all the change it promises. “You need to look to the next 50 years, not the last 50. I can indulge on that, but you have to look forward,” Moniz, who joined President Obama’s Cabinet in 2013, told about 4,000 graduates at a sunny, crowded Alumni Stadium. 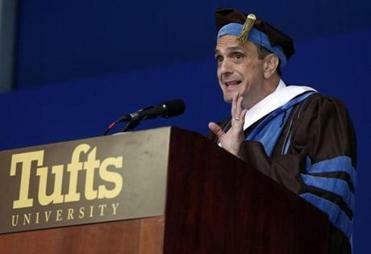 His remarks, capping BC’s 140th commencement, were a mixture of the inspiring and the sobering. He pointed out that members of the class were juniors when Boston was socked with record snowfall and were freshmen in 2013 when the Boston Marathon bombings staggered the city. Moniz also injected some humor into the ceremony, saying that “the perils of fast food would also become known to this class,” because of the December norovirus outbreak at a local Chipotle. The grandson of Portuguese immigrants and son of parents who did not have a high school education, Moniz enrolled at BC in 1962 and received a physics degree. He earned a doctorate in theoretical physics from Stanford and spent several decades as a professor and administrator at the Massachusetts Institute of Technology. As energy secretary, Moniz played a key role in the Iran-US nuclear deal and is a leading figure in efforts to combat climate change. Moniz credits his BC education with giving him the tools to work in an ever-changing world. The college conferred honorary degrees on Moniz and four others: the Rev. Emmanuel Mwerekande, humanitarian and pastor of the 50,000-member Our Lady of Fatima Parish in Uganda; John “Jack” Joyce, managing director of Deutsche Asset and Wealth Management and chairman of the Boston College Club; Nannette Marie Canniff, founder of the Saint Boniface Haiti Foundation; and María Eugenia “Gena” McGowan, principal of St. Matthew Catholic School in Phoenix. For some graduating seniors, leaving Chestnut Hill is a bittersweet moment. “I don’t think it’ll hit any of us until September when we’re normally supposed to go back to school,” said Liz Titterton, a Connecticut native and finance major. Stephanie Smykal, who received a master’s in nursing, was especially excited to finish up her education. The Bostonian found out she was pregnant two weeks after being accepted into the pediatric nurse practitioner program, and she attended classes as a new mom while also working at Boston Children’s Hospital. “My husband supported me the whole way, and I’m thankful for all of my friends; we couldn’t have gotten through it without each other,” she said. 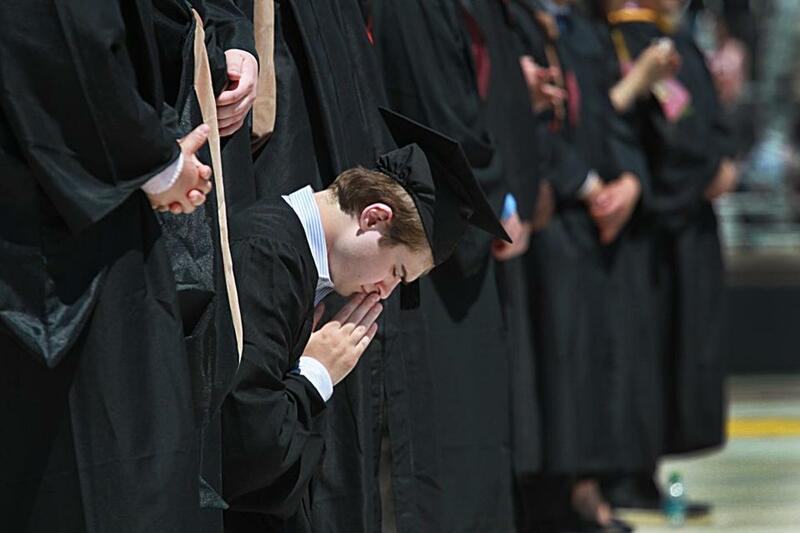 Students prayed at the end of BC’s commencement ceremony. Jon Mael can be reached at jmael2014@gmail.com.